Smalls is developed in partnership with PhDs in animal nutrition who formulate recipes as healthy and nutritious as possible. Each recipe went through many revisions until it was perfected for cats. The food is gently cooked, similar to cooking a chopped chicken salad at home but specifically for cats. Smalls food is made in a regulated human food facility in Chicago, by a small team of chefs. Smalls buys all human grade ingredients without using any by products, meals or artificial flavorings. The food is all prepared in a USDA monitored environment. As business grows they plan on buying vegetables from local farms. A variety of supplements from human grade sources goes into each recipe in different ways. All food is prepared on a weekly basis then frozen right away. High quality ingredients- Smalls only uses the best ingredients to guarantee quality and safety. If it’s not good for us, it’s not good enough for our feline family. Made fresh- Smalls is made fresh and sent straight to you. Your food never sits on a shelf, which means they can make food the way it was meant to be made. Cooked gently- Smalls cooks just like you would at home to preserve all of the nutrients and moisture that cats need. No BPA, preservatives or super high heat in their kitchens. To get started with Smalls, you will need to create a profile for your cat or cats. You may add up to 5 cat profiles. You will be asked to provide their current weight, activity level and recipe selection. You can also specify if your cat suffers from any health issues like allergies, diabetes, kidney disease, dental issues and more. You will be notified via email and text when your order ships and provided a tracking number. 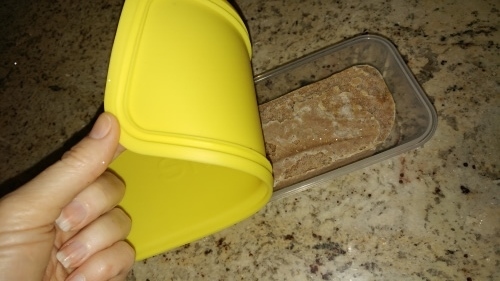 Each pack of food you receive is about three days worth of food so you’ll want to start defrosting a pack for each of your cats once it arrives. You can set up Smalls deliveries at a frequency that works best for you. They ship out every Tuesday and depending on how many cats you have, can deliver anywhere from weekly to once every 6 weeks. Less frequent shipping requests are discounted as well but shipping is always free. Smalls can be kept for up to 3 months in the freezer and once its thawed out, the food will stay fresh for 4-5 days. They recommend only keeping 3 days of food in the fridge at a time and keeping the rest in the freezer. Managing your account is easy and you can email [email protected] or text at (503)-487-4303 to pause your subscription (up to a week in advance) or cancel your shipments at any time. They are very responsive and quick with inquiries. In the future you will be able to manage your subscription directly on the website. I was notified that my shipment was being prepared and would be shipped in the next few days after signing up for Smalls. Unfortunately a week went by and I heard nothing else via email or text. I did notify customer service and they were on top of it and had the issue resolved in minutes. I then was updated via text and email of when my box would arrive. Once the adorable box arrived I noticed the foods were in brick like packaging and kept cold with dry ice. The box contained a smaller box with a food container to place your brick of cat food in, as well as broth and flavorings for picky eaters. 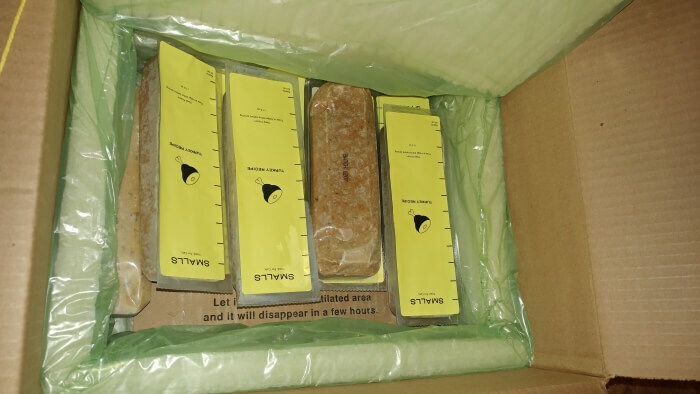 The shipment also included an instruction booklet that included recommendations on how to feed your cat the Smalls diet. When I first opened the packet I noticed there was no strong smell. It had the smells of a human turkey pot pie in my opinion. The texture was somewhere between canned and freeze dried in texture. This recipe is made with two kinds of protein, turkey and chicken, vegetables, and a mix of vitamins and nutrients. 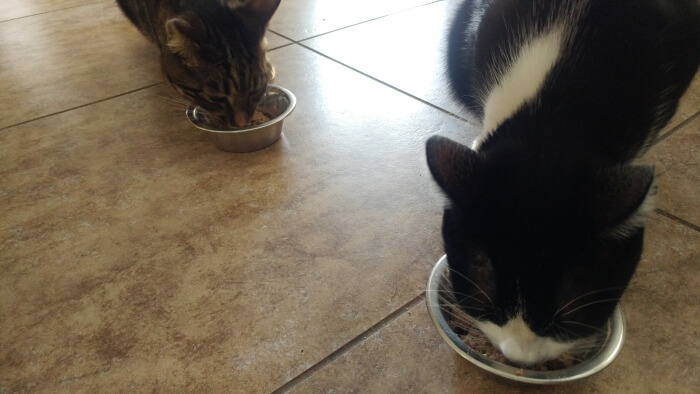 My two kitties are accustomed to more pate meals so I was worried they may not dive into this food. Because of the flaky type texture I added a little bit of water to food and stirred it up. When I placed the bowls of food down, they jumped right in. They ate it all quickly and seemed to want more. When I opened this packet, again noticed no strong odors and definitely not like wet cat food smells. The smell and texture reminded me of prepared chicken salad. This recipe is made with protein from chicken parts, vegetables, and a mix of nutritional supplements. Like the turkey and peas meal I placed the bowls of food down, and both cats jumped right in. There was nothing left behind and they licked the bowls clean several times, which I consider a good sign. Neither cat is particularly picky but sometimes they leave food in the bowl for later. After a week of feedings, both cats know the container with the yellow lid means dinner time. Both seem to be eating less kibble in the daytime which means they are getting full off the Smalls dinner time meals. They seem to enjoy both the Chicken and Turkey meals equally. 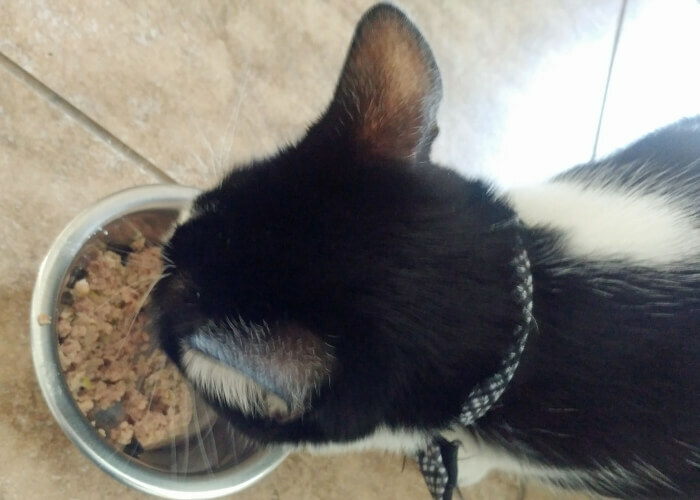 Smalls provides cats with fresh and quality protein packed food. I was impressed with the healthy ingredients as well as the packaging and portion sizes provided. Both my cats seemed highly satisfied with the meal selections they were given as well. If you are looking for human grade, made to order cat food, at a reasonable price, then Smalls maybe for you. *FTC Disclosure: We received this sample box for review at no charge. 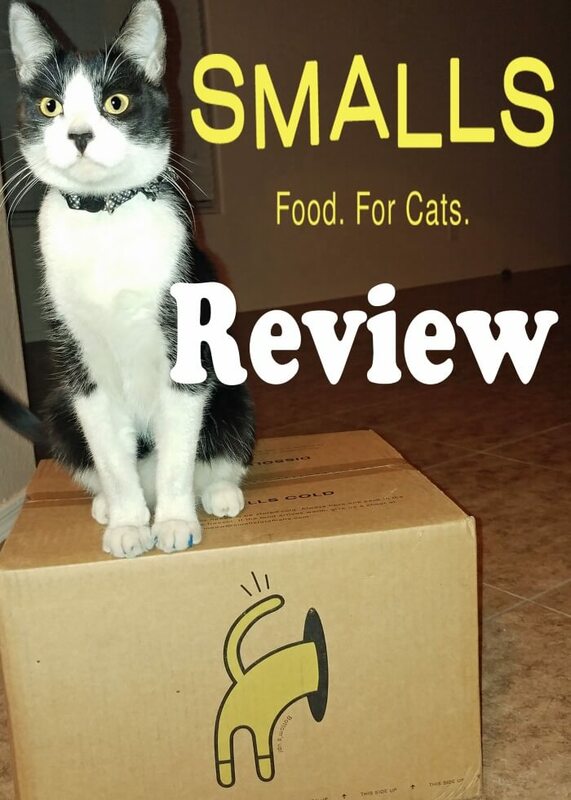 We’re all About Cats is an affiliate partner of Smalls. This means that if you decide to purchase through any of our links, we get a small commission. We only spread the word about products and services we’ve either used or would use ourselves. All of our reviews are unbiased, regardless of payment received, and always reflect our honest opinion or the opinion of our cats.